A simple way to take the edge off of the cold, windy, dryness of the late Autumn early Winter Vata season is with Ayush’s R-U-Ved ProVata Tea. I have no stock in this company, and get nothing but good karma for recommending their fine products. You can easily make your own, too, though the tea bags are so convenient, especially with travel. R-U-Ved ProVata tea is pro-Vata in the sense that it promotes balanced Vata; that is, it reduces Vata. We reduce, or pacify our doshas, because their natural tendency is to increase when our lifestyle, diet, or the climate elevates them. It does this by combining herbs that are warming, moistening, sweet tasting, and grounding, while gently promoting digestive fire/Agni, which tends to be weak in the case of Vata dosha, because Vata is wind, and wind is cold and blows out our Agni gut fire. While R-U-Ved claims on the box that this blend of herbs is calming, i would not go too far with that. The calming effect is subtle, and not strong like one of those sleepy time teas with passionflower, skullcap, and hops. This is above all a warming, grounding, digestive tea. To the extent Vata feels better when warm and moist, this will have a calming affect. I prescribe this tea frequently as a Kitchen medicine adjunct to for anxiety, restlessness, or insomnia, especially for Americans with diets heavy in cold and dry food, but to treat anxiety or insomnia you will also need more “heavy duty” medicinal herbs that strongly calm the mind. Ajwain is a spice that tastes vaguely like caraway. Vata types often suffer from cold and bloating in the gut. Ajwain is an excellent spice that provides relief from gas, cold, and bloating, although I have to say, of all the spices in this tea line, Ajwain is the least “delicious.” In Indian cooking it is excellent with potato or starchy veggies, because it is sharp and a little intense, in the way cumin is. Its inclusion in this tea makes the tea much more powerful for relief of gas and bloating. When I compare this tea the Maharishi Ayuveda Vatta tea, there is no comparison. The Maharishi one is sweet like licorice and warm like cinnamon, which makes it very soothing, but not useful at all for gas and bloating, and also does not so effectively kindle the Agni digestive fire as this brand. In fact for a Vatta type with really weak Agni, the Maharishi version could even be too cloying. But for a Vatta type with good Agni who is more anxious and nervous dry and brittle, the Maharishi one would be fine. It is soothing. Black Cardamon is often cooked with meats in Pakistani and Northern Indian dishes, because its such a powerful digestive herb. In Chinese herbal medicine we use this herb as a qi regulator for digestive problems due to cold. That is the same reason it is in this recipe; it warms the large intestine, the seat of Vata in the organs. Like Ajwain, it warms your whole being and fires up the Agni that is often weak in Vata types. Fennel is another warming sweet spice, and one that, like Ajwain and Cardamon warms the gut, especially the large intestine, the seat of Vata in the body, which is why it is in this masala (mixture). Ginger warms the stomach as well as the intestines. That is why it is also an excellent spice for Kapha elevation and many kinds of cold damp gut issues. If you are a Vata-Kapha or vice-versa, you almost can’t have too much ginger, fresh or dry. This is, of course, dry ginger, but i often add a slice or two of fresh into my cup. Licorice root is the one spice/herb in this tea that is not especially warming, rather it is moistening, like honey, and very sweet, which makes it all the more moistening (all sweets are moistening, which is why they are bad for wet, cold Kapha). Its nourishing and a little heavy, which makes it ideal for grounding spacy Vata. 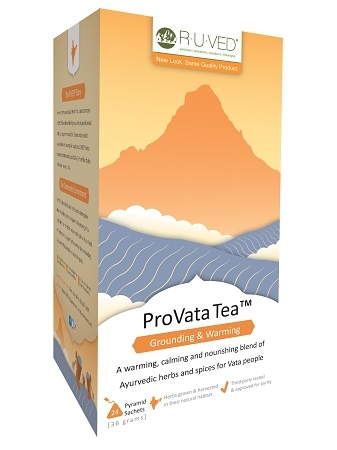 Who Should Drink R-U-Ved ProVata Tea and When? In a nutshell, Vata types are thin, with prominent joints, who get cold easily and tend to dry skin. They also tend to constipation, with lots of gas and bloating. They may be nervous and anxious and tend to sleep issues. This is a really generalized picture, so if you want to know your dosha for certain, consult an expert. But if you have all those characteristics, most definitely you have a Vata dosha. But you will also need to know your secondary dosha and how they interact, which is why its important to consult and expert for an Ayurvedic consultation. In the Vata season this is an excellent beverage for almost anyone to drink, but it is especially good for people with Vata imbalances in the gut manifesting as excessive gas and bloating, or slow digestion. It is also good for anyone who gets cold easily or has cold hands and feet. Vata dominant types, especially, should drink a tea like this from late Autumn through the end of early Winter, and possibly year round, depending on their strengths and weaknesses. Year round I give this to anyone who presents with cold hand and feet, who gets cold (not colds) easily, or who has chronic flatulence and bloating, but without burning in the upper GI. It can be a very good choice for people with Ulcerative Colitis. People with Interstitial Cystitis or Diverticulitis with burning sensations may not tolerate these warm spices and may do better with R-U-Ved ProPitta tea. I also prescribe this to people with cold type osteo-arthritis and chronic cold myofascial pain. This is also a tea excellent for building healthy Agni digestive fire in Vata types, and, consequently reducing Ama, digestive toxins. When I see anxious cold types with chronic runny noses, this is often a tea i use along with the Pitta tea if there is heat or the kapha tea if there is phlegm. This is also a good tea for Vata type people that hate wind and catch cold easily when exposed to wind and when they get chilled. This tea builds Agni metabolic fire, and as such can be seen as a tea that boosts the immune system indirectly, by unclogging and cleansing the lymphatic system. As such, it is an excellent tea for chronic cold type allergies with runny nose and watery eyes, but may be combined with something cooling in those cases since there is also often heat. Simple addition is peppermint or chrysanthemum, Ju Hua in Mandarin. This is a beverage amongst medicines, and a medicine amongst beverages, so drink as much as you want if you are prone to cold hands and feet, overall cold, you have dry skin, and above all, weak digestion without heartburn or any burning, but with bloating and rectal gas, and possibly constipation. Drink it hot in cold weather, and in hot weather you can drink room temp. What I do in summer is place two bags in a quart of hot water just off the boil, and allow to cool down and then drink during the day. I often use one bag of ProVata and one bag of ProPitta, which suits my dual dosha. So if you are Vata-Kapha then modify according. I leave the bags in the bottle all day and allow the essential oils of the spices to seep into the water, and often get a second more dilute quart out of it. copyright eyton shalom, la.c, jan 2014 all rights reserved use with permission only.